The Mayor of Bossier City, Mayor Walker read a city proclamation making 12 Sep 15 National Drive Electric Week. The proclamation was the proposed document from the NDEW media web page. The opening of the event was covered by the local NBC TV station who provided coverage of the event on the 12 Sep 15 evening news. The event was held inside the Louisiana Boardwalk mall. This location created a steady supply of people who would never have seen the event otherwise. 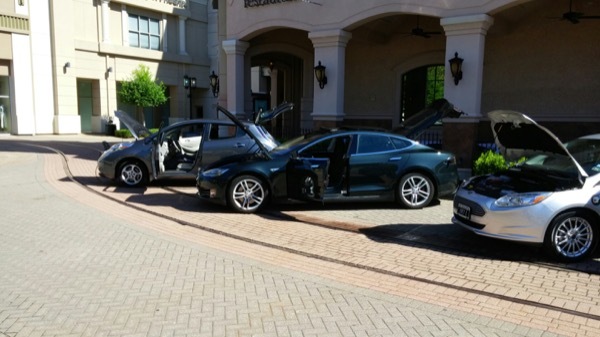 The 15 volunteers with 9 cars (Tesla Model S, Nissan Leaf, Chevy Volt and Ford Focus) spoke with approximately 300 people. Many people were greatly surprised on the relatively cheap entry costs for the Leaf/Focus verse the cost of their current car. FREE and open to the public! Come join us and check out a variety of electric cars and plug in hybrids. Opening comments will be provided by the Bossier City Mayor. Help us spread the word with our Facebook event. Registered attendees report 142,000 electric miles driven.